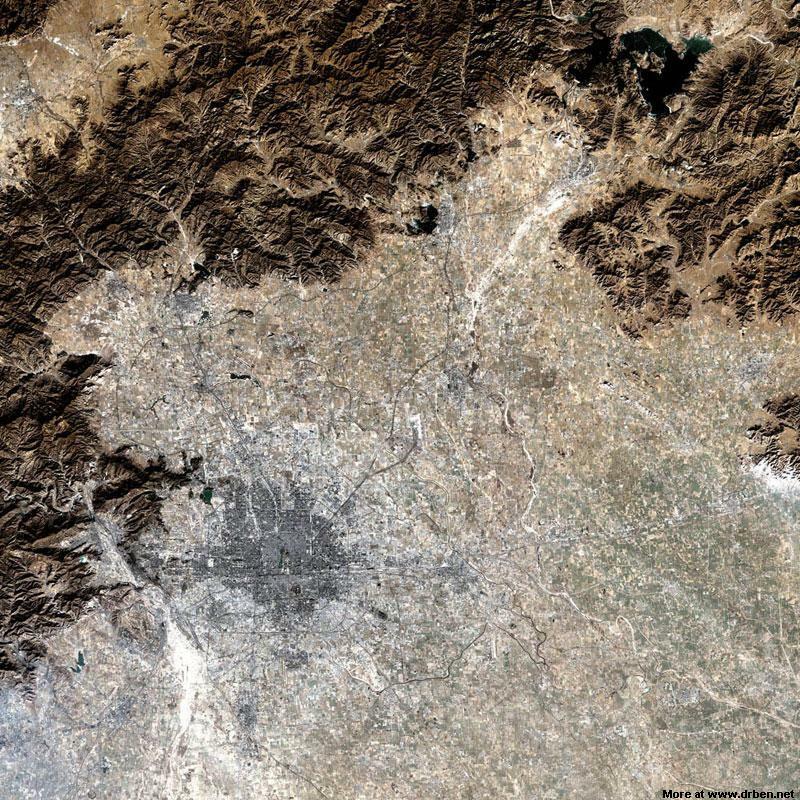 This Satellite Image clearly shows Beijing City ( the dark grey blob left and low off-center ) enclosed by its Surrounding Mountains. In the North-West of the City Outskirts the huge hand-dug Kunming Lake, part of the Summer Palace Park on the outer edge of Haidian District is clearly visible. Further away almost due North of Beijing Badaling pass, a Great Wall of China location is clearly distinguishable with the Ming Tombs Valley stretching to its South-East. Almost in the middle of the Upper Half of the Image , The Giant Miyun Reservoir, source of the City Water-supply is easily found. The Great Wall at Simatai is just North-East of the Lake, well within the Mountain Range. East from there lies the steep Great Wall at Mutianyu, another Pass along the Great Wall of China near Beijing. 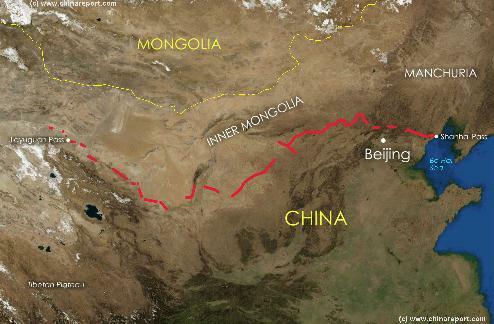 Use our adjacent Great Wall of China- and Great Wall at Beijing Site- Maps for further understanding of the Immense Great Wall Monument. The extensive Yiheyuan Summer Palace and Beijing Capital Airport, an equally large area are highlighted. Chengde Summer Palace (Bishu Shanzhuang) lies outside this Map. The Great Wall at Mutianyu , a magnificient section of the Great Wall of China some 75 kilometers outside Beijing City. 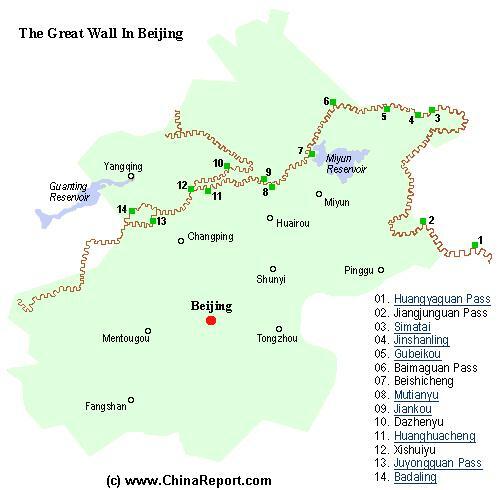 A Schematic Map of Beijing City Province and ALL Locations of The Great Wall of China visitable within Beijing City Province and Immediate Vicinity. Find the Great Wall at Yellow Cliff (HuangYaGuan), JiangJun Guan, Simatai, Jinshanling, Gubeikou, White Horse Pass (Bai Ma Guan),Beishicheng, Mutianyu, Jiankou, DaZhenyu, Huanghua-cheng, XishuiYu, Juyong Guan Pass and Fortress and finally Badaling.